Don Yaeger is a dear friend of mine. He’s joined me onstage for Live2Lead, Executive Circle, and together we produced The Mentor’s Guide to Building a Championship Team. His knowledge of sports is legendary, but his insight into the leadership lessons sports contains is greater. This week, I’ve asked Don to write a guest post for my blog because he’s also appearing as my guest on The John Maxwell Leadership Podcast. I know you’re going to love Don and you’re going to grow because of what he shares. You can learn more about Don at www.donyaeger.com. I’ve been fortunate to have some great mentors in my life. In fact, a great mentor is something that John Maxwell and I share in common. Both of us were privileged to spend time learning from the incomparable John Wooden, legendary coach of the UCLA Bruins. Coach Wooden was a consummate mentor—always eager to spend time with me, always happy to share his wisdom and insight on even the most far-ranging of topics. I can recall almost all of the times I spent with Coach, my notepad open, my pen moving feverishly across the page. “There’s not a thing you know that wasn’t taught to you by someone else,” Coach once told me, and I still believe that’s true. My parents, teachers, professors, editors, and other mentors have helped me expand my knowledge by adding their wisdom of experience to my own. When Coach Wooden passed away, it was one of the saddest days of my life. But thankfully, because of his commitment to mentoring, another John took his place. A few years ago, I met John Maxwell, and we bonded over a love of sports, leadership, and the lessons we learned from Coach. 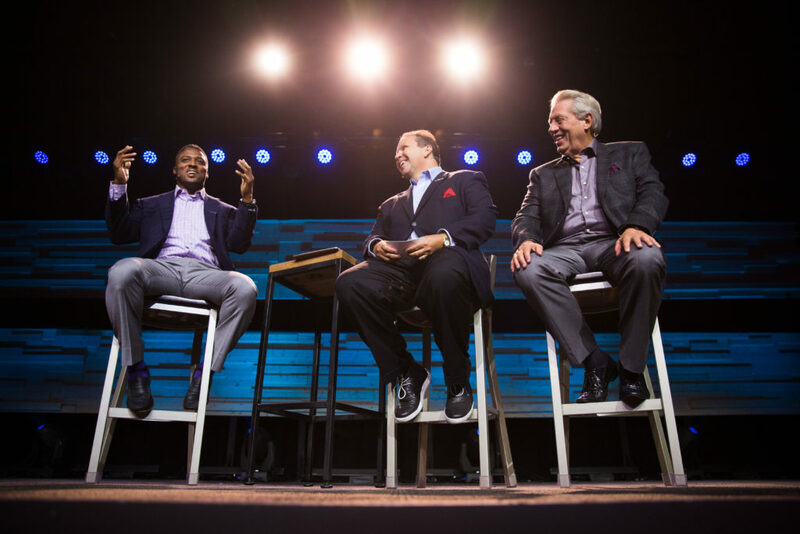 I’ve been blessed to call John Maxwell my mentor for a while now, and I love every moment I’m able to spend with him. Whether it’s phone calls or face-to-face meetings, I know I’m going to come away with something valuable for my growth, because John Maxwell is faithful to what he learned from John Wooden. There’s perhaps no one better suited to share with you the four characteristics of great mentors, as taught by John Wooden and John Maxwell. I’ve spent hours with both of them, and I can say that they both demonstrate these attributes. As I’ve studied professional and amateur sports for the past three decades, I can also tell you that these four traits are present in all of the best coaches, and they are what you need to look for when it comes to finding a mentor of your own. You can’t take a journey if you don’t know where you’re going. The best mentors have expectations for what they can teach and where they can take their mentees—and they share those expectations upfront. Coach Wooden expected me to come prepared with questions, expected that I’d be on time, expected that I would need room to follow certain conversational rabbit trails. Because he set the table for success, I came away from every mentoring session feeling like I’d gotten more than I deserved. I’m not talking about cry-on-Oprah vulnerable, though good mentors aren’t afraid to tap into their emotions if it will help. True vulnerability comes from being honest about our faults and weaknesses—which requires being self-aware enough to know you have them. Nobody models this better than John Maxwell. Whenever I spend time with John, he isn’t afraid to be himself in our conversations. John’s honesty about his own struggles and challenges is not only refreshing, it’s instructive, because John doesn’t just make mistakes—he reflects on them in order to learn from them. That’s one of the most powerful lessons I’ve learned from John, and it’s only because he is willing to be vulnerable. Let’s get this clear: a mentor has the ability to put down their phones, laptops, or other distractions, and focus their attention on you. That means they actively listen with both their ears and their hearts and bring intellect and empathy to the conversation. Fortunately, Coach Wooden didn’t have an iPhone, so there weren’t too many dangers of distraction with him. But John Maxwell does have an iPhone, and people are usually trying to reach him on it. I’m always impressed with the way John puts his phone away so he can listen fully during our time together. I don’t know about you, but I’m a lousy translator. I’m not talking about translating from one language to another; I’m talking about translating the well-intentioned junk that some people say when they aren’t comfortable just speaking the truth. We all know how frustrating it is when someone we respect can’t bring themselves to give us their genuine thoughts and opinions. Both John Wooden and John Maxwell embraced the power of direct honesty. In fact, one of my favorite coaching moments of all time is when Coach Wooden, who had a strict “no facial hair” policy for his players, was confronted by a scruffy Bill Walton. Walton, who was Coach Wooden’s most talented player, was resolute about not shaving, even after Coach reminded him of the team’s policy. Walton immediately went and shaved. It was Coach Wooden who helped me understand the vital role that mentoring plays in personal and professional growth, and John Maxwell has taught me that mentoring is the ultimate “pay-it-forward.” As a result of both men, I have spent the last few years of my career seeking to add value to others as a coach and mentor. I’ve even followed in John Maxwell’s footsteps and developed my own digital course that teaches 16 lessons on Greatness, lessons I’ve learned over my entire career as a sportswriter. Lessons learned at the feet of Coach Wooden, John Maxwell, Michael Jordan, and others. As a way of paying back what I’ve learned from John Maxwell, I’m offering a free sample of the course to readers of his blog—you can access your free sample by clicking this link and signing up today. What John Wooden and John Maxwell have poured into me, I would be honored to pour into you. But no matter who you choose for a mentor, make sure he or she meets the four characteristics outline above. You deserve mentors who will give you their best—and bring out the best in you. Very good lesson on mentorship. It has helped me to identify good mentors. That is great to hear Eugene! I appreciate you. Great lesson! Definitely 4 great characteristics to be aware of for your mentor. Wow! To be mentored from one of the greatest men in sports’ history, John Wooden. And from the international leadership guru and expert John Maxwell! I have been mentored from a couple of men. Both had great integrity, great wisdom and maturity. I am still sort of being mentored by, M. Foley. He is one of the greatest and godliest man that I have known. I have learned a lot about leadership, mainly from JM. And a lot from the other parts of his acronym. R – Relationships; E – Equipping; A – Attitude; L – Leadership. I did a report while getting my Master’s in Theology on his book The Difference Maker: Making Your Attitude Your Greatest Asset. And I have read/listened to several others. Buy my favorite book that both I, and M. Foley went through together weekly meeting at a Starbucks in town: The 15 Invaluable Laws of Growth. I would say though if you don’t have access to any great men to mentor you such as Maxwell, Wooden, or Yaeger. Buy their books, courses, and programs! And let them mentor you! Linda Eggers, JM’s lifelong assistant turned me onto that idea about learning from Maxwell’s books. And that principle can be expanded to any great people in life. Didn’t mean to go on so many rabbit holes. My favorite point you made, Don. Was the ‘Leaders Listen With Their Head and Hearts.’ And that can be applied to any other relationships with people in your life. Even at your job with customers and coworkers. I do that with every parent that calls me every day at work without realizing that point that Don made. Very Great article Don by the way! I appreciate this important TODAY writing and Sean’s mentoring comments. We are walking each other home.